Music of Words offers production services to present your project in DwREAM. “The Ephemeris” by William Jay was created in a unique format of presentation called DwREAM (simply pronounced “dream.” For Celtic speaking people, the w is a soft “oo” sound and the r is trilled.) DwREAM is an acronym that stands for: Dramatic Writing and Reading Entrained and Articulated by Music. The entire narrative of The Ephemeris is verse written to an ever-changing variety of meters, as in a song or collection of songs. Although there is NO SINGING! The music marries to the meter of the narrative in a variety of ways, sometimes as in a song, sometimes as a counterpoint or metrical undercurrent to provide color or dramatic emphasis or raw energy. The music exists throughout the work, carrying or entraining the narrative, although, again, it is ever-changing, sometimes phrased to whole verses, other times adding a word-for-word counterpoint or even accenting individual syllables. The result is an immersion in the musical experience, in an emotional, theatrical, and mysterious interplay of drama and orchestration; with the music as much a literary and storytelling voice as any character’s in the play. While serving as its own voice, and as a musical score would normally serve the purposes of drama, the novel use of music in DwREAM offers a truly heightened literary experience. The Ephemeris is meant to be read simultaneously while listening to the dramatic performance, at least the first time through. This has as much to do with the metrical interpretation of the musical component as the dramatic interpretation of the literature. Not to get too dry and technical, but the musically entrained component of DwREAM is processed by a different part of the auditory cortex of the brain from that which processes the conventionally, visually read part. Total immersion is often reported as the result of the experience, and an increased apprehension of the literature. We have hopes that this format might be a useful learning tool for autistic or learning impaired students. More work, we hope, to come on this front! Footnotes have been included to aid with understanding the dialect and vocabulary of The Ephemeris, some of which is Elizabethan, and yet should be mostly familiar to the average literary reader. The aim is to keep the stream of music continuous, so that the spell is never broken within the flow of the narrative by a confusing word or phrase. 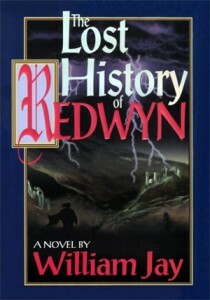 The intention is that the reader would glance down at the footnote to get the meaning of a word marked with a dagger (†) symbol, and then resume reading where the audio narrative is playing. Feedback on this methodology has been positive, with our audience members reporting a general ease of reading the footnotes and a preference for having them, if needed, at hand. Lastly, but certainly not of least significance, is that DwREAM was created to be the most entertaining experience to be had from a book. We are pleased that so many of our early test audience agree. It is certainly a different way to experience literature, and we WELCOME YOUR FEEDBACK. There is so much more we hope to create in the DwREAM format. With our audience’s help, this, we hope, is just the beginning! Music of Words offers production services to present your project in DwREAM. Fees specific to each individual project, contact us to discuss yours. 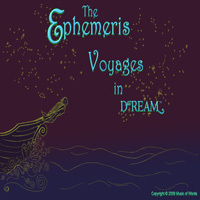 Thus, for all we have said about DwREAM, we are selling The Ephemeris as a BUNDLED BOOK/AUDIO Package. We have a SPECIAL INTRODUCTORY OFFER for the 1st products in our innovative DwREAM format! ORDER NOW! THE FIRST EDITIONS ARE LIMITED! 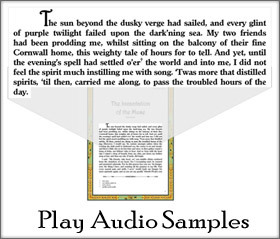 THIS IS A BEAUTIFUL, HIGHLY COLLECTIBLE BOOK/AUDIO PACKAGE! SPECIAL INTRODUCTORY PRICE IS A LIMITED TIME OFFER!